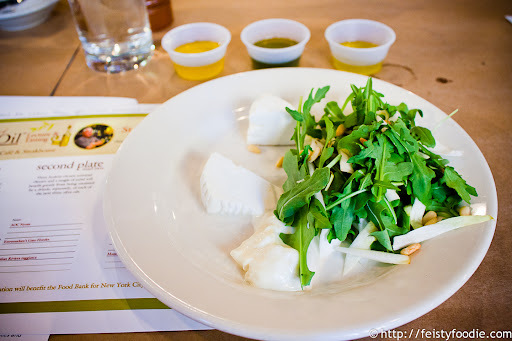 Recently, Fairway Market had an event called The Story of Olive Oil. 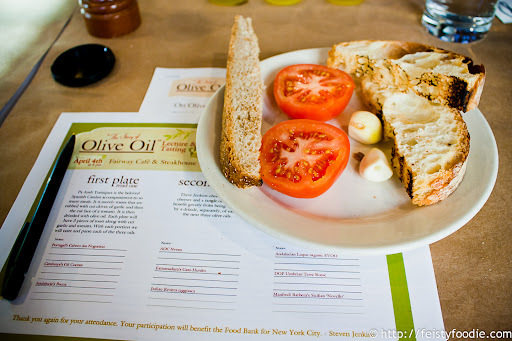 I was invited as a guest to attend and learn about the history of olive oil, as taught by Steve Jenkins. It was really interesting. Steve led us around the world and explained 9 different olive oils to us. Next we sampled three different cheeses with a quick salad, and three different olive oils. Again, I had my favorite that I wanted to simply drink from the little cup, but I refrained. I realize many of you are now wondering “Well, aren’t you going to tell me which olive oil you liked?” but no, I’m not going to. More on that in a second. We finished with lovely apple tarts a la mode – no olive oil this time. I’m not sharing which olive oils I liked best because taste is a matter of personal preference. Maybe you’d like a different one more or less than I did. Whichever – my point in posting this is that you should all keep an eye on Fairway’s website for more such events, as they’re fun, informative, and they feed you so much! Tickets to this particular event were going for $40, and there are sure to be more to come. Thank you to Susan for inviting me to this event – I had a great time and learned a lot about olive oil’s origins and what I like or don’t like in olive oil! Per usual, I received no monetary compensation to post about this event, nor was I obligated to do so, positively or negatively. However, I did feel that this was an informative event that any of my readers would be interested in attending the next time they have one! So sorry to have missed this one! It was a lot of fun. Next time, you’ve got to come with me! It’s only a short walk to you as well (I walked to Hell’s Kitchen afterwards). But your loss was my gain! Thanks to Yvo for inviting me. As someone who neither eats nor uses a lot of olive oil I got to learn a lot. Ummmm. Love pan tumaca. Put a slice of serrano ham on top of it and enjoy life. What are the different olive oils? Yea, I meant to elaborate on the nine different ones, but I guess I can google it myself. lolol.